Gallows Run Watershed Association - Understanding Changes in Our Weather Patterns: How does Global Climate Weirdness effect Us? When studying water resource issues for our townships, one of the key factors to understand is precipitation. We need to consider the effect of climate change, such as: have we seen changes in precipitation events, what are the trends, if any, and what might we expect to see in the future? Then after looking at the trends in past weather events to better predict the future behavior, what might we do to prepare for the changes in weather behaviour and to mitigate any adverse effects? We will show local trends in weather, how that relates to our national weather, and how it relates to global weather. There is much confusion about what is meant by the term ‘Global Warming’. ‘Global Warming’ is an oversimplification and leads to misinterpretation of effects. 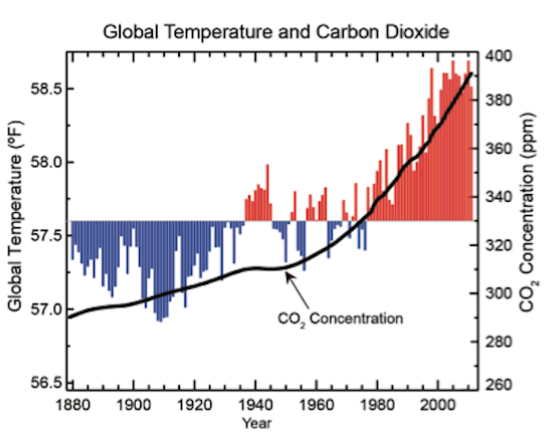 There is much evidence that the world is warming ever so slightly. This increase is measured in a few hundredths of a degree per year, far to slight to be perceptible by personal observation. When the normal annual swings in temperature range from 0 °F to 100 °F, how could you possibly feel a change of 1/100 of a Fahrenheit degree of average increase from last year? At the same time, some areas are undergoing record heat waves and drought (the American Southwest) other areas are undergoing grater than average precipitation (the American Midwest and Northeast), and yet other parts of the globe are now undergoing unusual cooling (Europe). These simultaneously dissimilar events are not compatible with a simple understanding of ‘Global Warming’, but rather with a more nuanced view in the light of ‘Global Climate Change’… or ‘Global Climate Weirdness’. Consider that an increase in air temperature and an increase in the temperature of the Gulf of Mexico, that the weather now has more energy and is able to hold much more water in the atmosphere than when it is cooler. Then an increase in the number, frequency and violence of extreme weather events is not surprising. Thus the most noticeable effects of a warming world may not be seen as an increase in temperature, but rather an increase in violent and erratic weather. 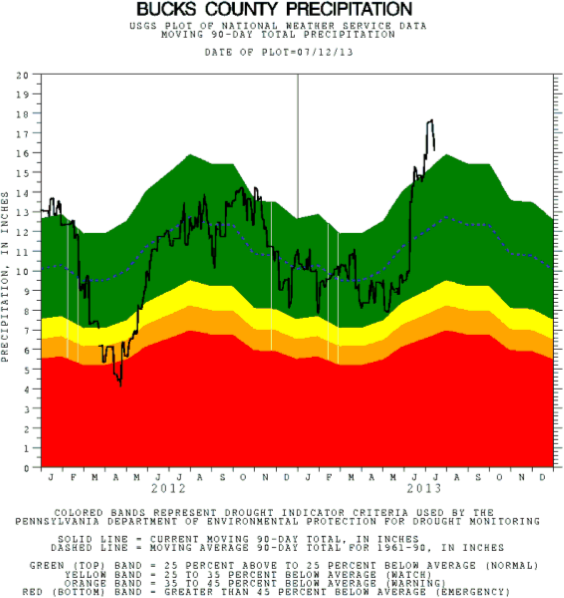 Where the red line is the linear trend, and the green line is a moving average. Click here for an updated version of the graph. 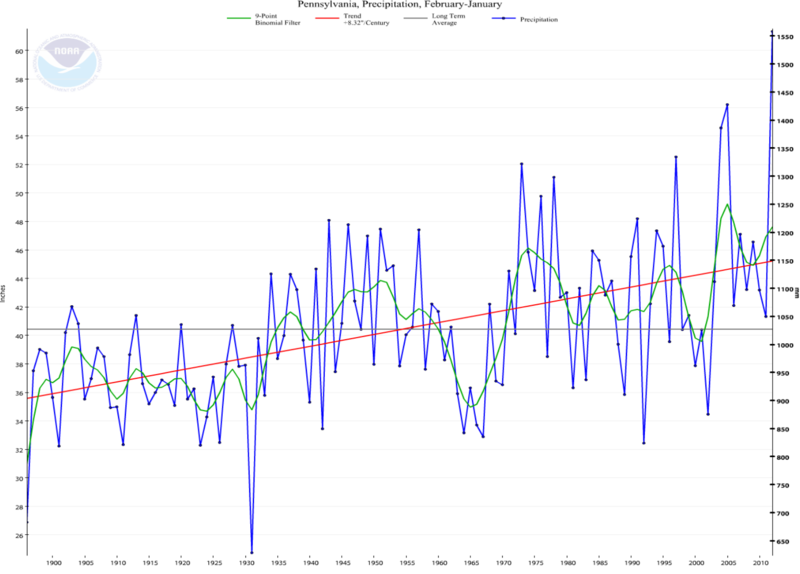 In the above graph, we can see a drought in 1931 (the Dust Bowl) and in the mid-sixties (a 50-year drought), but we can also see an increase in the average annual precipitation from about 35 inches per year in 1900 to about 50 inches per year recently. This is a substantial change in precipitation, but the other thing to notice is that the amount of precipitation is more erratic. From 1895 to 1980 the year-to-year variation was not very much. 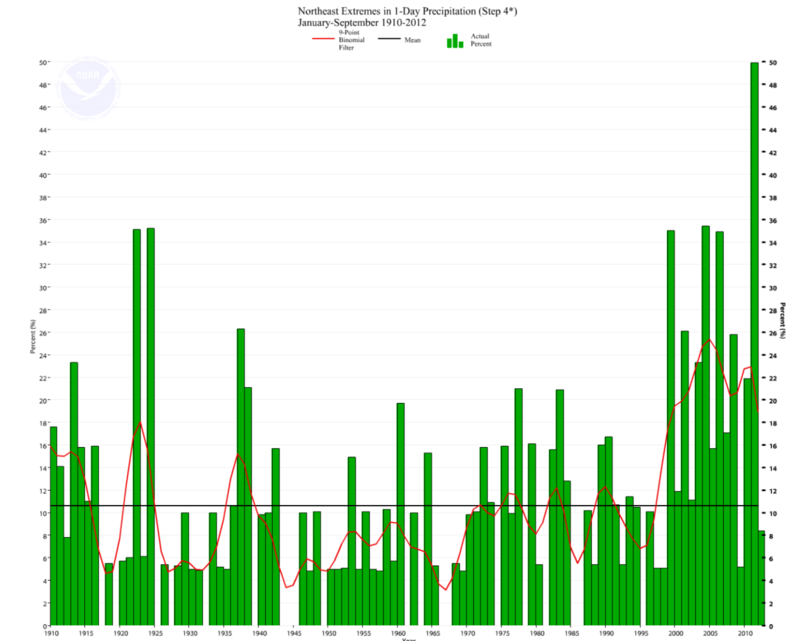 But now the year-to-year high and low extremes are widening; one year we may have 35 inches, the next we may have 55 inches, and this year we are on tract to set a new record. Regular precipitation patterns are good for farming, while such wide swings will play havoc in food production. When you click here, you will get the now current precipitation departure from what would be expected for that time of the year. This is a 90-day moving average where we expect to get the highest precipitation in the summer and the least in the winter. The expected amount is the dotted blue line. Of note in this graph is that in April 2012 we were in the drought area, now in July 2013 we are off the chart in the opposite direction. This is typical of the now more common pattern of erratic variations in weather patterns. We now expect highly variable weather patterns. We see the Midwest and the Northeast with at least 10%, or more, precipitation than normal and the Southwest in a drought. This is based on the average precipitation from 1902 to 1960. But that is the precipitation, what about the changes in temperature for the years of 1991-2011 when compared to the same base period? The graph below show most of the US is getting quite hotter. 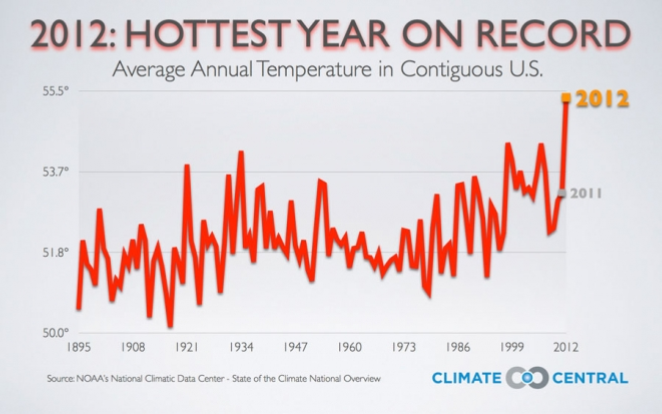 A one or two degree increase may not seem like a lot, the problem is if this trend continues. It should be pointed out that if the global temperature were to increase two degrees, there would be major problems, but we probably find ways to adapt. However, if that trend extended to a five-degree increase, it would be catastrophic for life on Earth, causing a major mass extinction. The colors on the map show temperature changes over the past 20 years in °F (1991-2011) compared to the 1901-1960 average. The bars on the graphs show the average temperature changes by decade for 1901-2011 (relative to the 1901-1960 average) for each region. The far right bar in each graph (2000s decade) includes 2011. 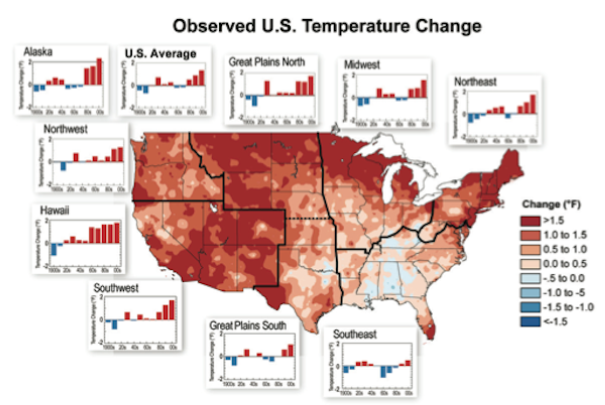 The period from 2001 to 2011 was warmer than any previous decade in every region. (Figure source: NOAA NCDC / CICS-NC. Data 11 from NOAA NCDC. ) Credit: National Climate Assessment. Please notice the warming beginning around 1980 and reflect on the increased storm activity mentioned earlier that started to happen around 1980. There is an impressive and informative 26-second video on the following link from NASA that shows the average temperature departures from normal mapped on the globe from to 1880 to 2012. So where what do we do with all this information? We need to expect, plan for and not be surprised by weird weather. It is just as likely that this winter we may get only a couple of inches of snow as six feet. It seems that the new normal is that it will not be normal. When you see a new extreme weather storm taking place, consider that with a warmer world there is more energy in the atmosphere, the storms will be more violent and more extreme. This extreme event, (the current drought, record heat and fires in the Southwest, or a month of continuous rain causing floods in the Midwest, another blizzard of the century, or another storm of the century such as Katrina or Sandy), it is not an isolated event; it is a part of a pattern of non-typical weather. The major effect of climate change is not just warmer weather. It is the consequences of the warmer climate on the weather system producing erratic patterns. It is far better for us to have four storms that give us one inch of rain that it is for one storm to give us four inches of rain to recharge our aquifers. While Pennsylvania seems to be in a wetter trend for the last few decades, with weird weather, next year we could have a major drought, or a cold summer, or a frigid winter. In planning for weird weather, we need to reconsider how we handle development so that we can control stormwater. We may want to use all the best management practices. We may want to recommend smaller lawns on hillsides to lessen sheet-flow during storms. We may want to recommend vegetation (bushes and shrubs) to retain the water long enough that the streams are not as likely to flood. We should be very sceptical with the siting of developments based on the extent of a hundred or a five hundred year flood line. When we are having a hundred year flood every other year, these terms have now lost any literal meaning. How many ‘storm of the century’ storms can you have every year? We need to plan for power outages lasting a week or longer happening ever year or two. In short, we need to plan for the unexpected on a personal, municipal, state and national level.